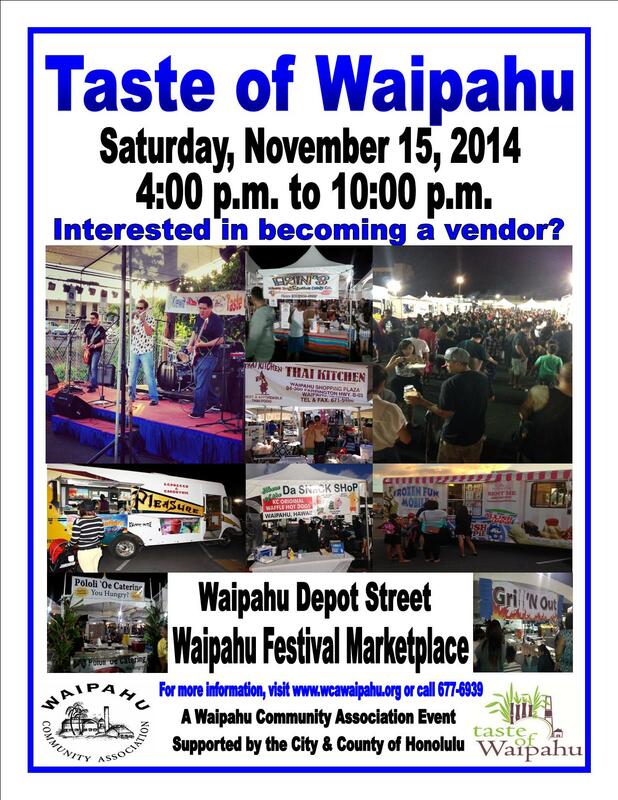 Want to be a vendor at our Taste of Waipahu Event this year? Okay all you excited fans, the moment you have been waiting for is here!!! 9th Annual Taste of Waipahu event. This year, the event will be on Saturday, November 15th from 4pm – 10pm at the same location as last year’s, in the Waipahu Festival Marketplace Parking lot and Waipahu Depot Street. As you may know, this positive community event showcases the best of what Waipahu has to offer. This included great food, building awareness of businesses in our area, entertainment and fun for families. Last year’s event drew nearly 11,000 people from all over who came to enjoy this spectacular event! We are looking forward to another fun filled event. If you are interested in becoming a vendor, please view all the information which includes the Vendor Flyer, Vendor Checklist, Vendor Application and the Contract Terms and Conditions. See the forms for more info. Space will not be confirmed until we receive your payment. Once payment is received, then we will assign booths on a first come first served basis. SPACE IS LIMITED! Click on the links below to view all the necessary documents.